One of my weaknesses is Tim Horton’s Steak & Cheese Panini Sandwich. If I’m out over lunch (a rarity for me!) and not concerned about eating on plan, I will usually indulge in the chewy bun, stuffed with thinly sliced beef, red onions, mushrooms, and white cheese. It’s full of great fats, but unhealthy carbs and definitely not friendly to the waistline, so I thought I’d try my hand at converting the recipe into a Trim Healthy Mama-friendly S pizza made from the infamous, low-carb Fat Head pizza dough. It worked out wonderfully, and we’ll certainly be enjoying this low-carb Steak & Cheese Pizza again soon! A nice change from pepperoni pizza, all you need to make this Steak & Cheese variation are the ingredients for one Fat Head pizza crust, and the toppings I’ve listed below. To make it less chewy, I used strips of thinly sliced roast beef (the kind you can find in your deli) for the “steak.” I also added some green pepper in addition to the onion and mushrooms to give it a Philly flair, but you’re welcome to leave those off if that’s not your thing. Adding dried rosemary and a little garlic powder to the Fat Head Dough lends a wonderful flavor to the crust. I recommend leaving out the salt though as the cheese and roast beef strips are salty enough. 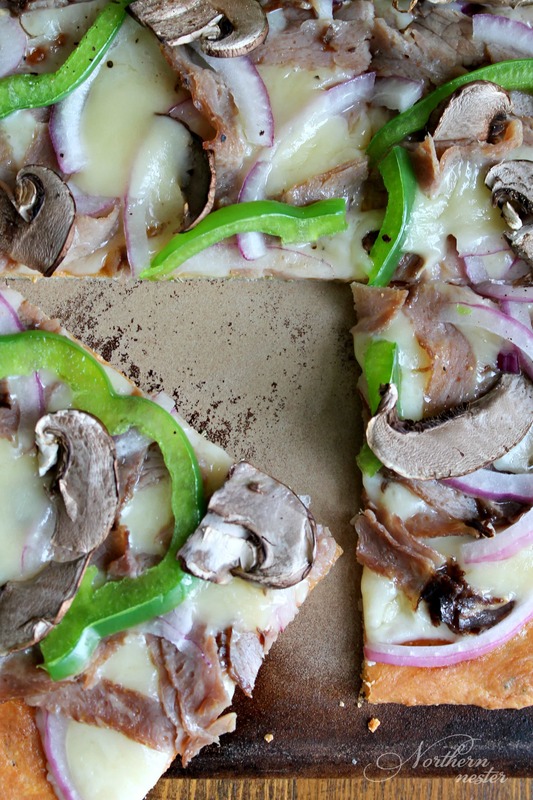 Steak & Cheese pizza is a delicious alternative from the ordinary! Made with a low-carb Fat Head Pizza Crust, this recipe is Trim Healthy Mama S.
Sprinkle a layer of mozzarella cheese on your Fat Head Pizza crust, followed by deli roast beef strips, red onion, peppers and mushrooms. Scatter a few chunks of mozzarella on top and sprinkle on a grind or two of black pepper. Bake at 425 F for 5-7 minutes or until cheese is melted.